Ben Graham, one of the best investors in the 20th century, lays out some easy-to-follow guidelines on how to be a successful investor. His main categories for investors are either defensive (don’t know much about analyzing stock or don’t want to invest the time) and enterprising investors who are willing to spend hours reading and researching stocks.These guidelines are often so straightforward you think you must be missing something but the true challenge comes to adhere to this discipline when your real money is on the line. Our main objective will be to guide the reader against the areas of possible substantial error and to develop policies with which he will be comfortable. We shall say quite a bit about the psychology of investors. For indeed, the investor’s chief problem — and even his worst enemy — is likely to be himself. Far from being an afterthought, dividends are the greatest force in stock investing. A great deal of brain power goes into this field, and undoubtedly some people can make money by being good stock- market analysts. But it is absurd to think that the general public can ever make money out of market forecasts. Let us close this section with something in the nature of a parable. Imagine that in some private business you own a small share that cost you $1,000. One of your partners, named Mr. Market, is very obliging indeed. Every day he tells you what he thinks your interest is worth and furthermore offers either to buy you out or to sell you an additional interest on that basis. Sometimes his idea of value appears plausible and justified by business developments and prospects as you know them. Often, on the other hand, Mr. Market lets his enthusiasm or his fears run away with him, and the value he proposes seems to you a little short of silly. If you are a prudent investor or a sensible businessman, will you let Mr. Market’s daily communication determine your view of the value of a $1,000 interest in the enterprise? Only in case you agree with him or in case you want to trade with him. You may be happy to sell out to him when he quotes you a ridiculously high price, and equally happy to buy from him when his price is low. But the rest of the time you will be wiser to form your own ideas of the value of your holdings, based on full reports from the company about its operations and financial position. The true investor is in that very position when he owns a listed common stock. He can take advantage of the daily market price or leave it alone, as dictated by his own judgment and inclination. He must take cognizance of important price movements, for otherwise his judgment will have nothing to work on. Conceivably they may give him a warning signal which he will do well to heed — this in plain English means that he is to sell his shares because the price has gone down, foreboding worse things to come. In our view such signals are misleading at least as often as they are helpful. Basically, price fluctuations have only one significant meaning for the true investor. They provide him with an opportunity to buy wisely when prices fall sharply and to sell wisely when they advance a great deal. At other times he will do better if he forgets about the stock market and pays attention to his dividend returns and to the operating results of his companies. Recognize that investing intelligently is about controlling the controllable. You can’t control whether the stocks or funds you buy will outperform the market today, next week, this month, or this year; in the short run, your returns will always be hostage to Mr. Market and his whims. But you can control: your brokerage costs, by trading rarely, patiently, and cheaply your ownership costs, by refusing to buy mutual funds with excessive annual expenses your expectations, by using realism, not fantasy, to forecast your returns your risk, by deciding how much of your total assets to put at hazard in the stock market, by diversifying, and by re-balancing your tax bills, by holding stocks for at least one year and, whenever possible, for at least five years, to lower your capital-gains liability and, most of all, your own behavior. Patience is the fund investor’s single most powerful ally. As Graham put it: “In 44 years of Wall Street experience and study, I have never seen dependable calculations made about common-stock values, or related investment policies, that went beyond simple arithmetic or the most elementary algebra. As Graham liked to say, in the short run the market is a voting machine, but in the long run it is a weighing machine. The margin of safety is the difference between the percentage rate of the earnings on the stock at the price you pay for it and the rate of interest on bonds, and that margin of safety is the difference which would absorb unsatisfactory developments. The margin of safety is always dependent on the price paid. It will be large at one price, small at some higher price, nonexistent at some still higher price. For most investors, diversification is the simplest and cheapest way to widen your margin of safety. The future value of every investment is a function of its present price. The higher the price you pay, the lower your return will be. No matter how careful you are, the one risk no investor can ever eliminate is the risk of being wrong. Only by insisting on what Graham called the “margin of safety”-never overpaying, no matter how exciting an investment seems to be-can you minimize your odds of error. The secret to your financial success is inside yourself. If you become a critical thinker who takes no Wall Street “fact” on faith, and you invest with patient confidence, you can take steady advantage of even the worst bear markets. Swings govern your financial destiny. In the end, how your investments behave is much less important than how you behave. It has long been the prevalent view that the art of successful investment lies first in the choice of those industries that are most likely to grow in the future and then in identifying the most promising companies in these industries. The experts do not have dependable ways of selecting and concentrating on the most promising companies in the most promising industries. It is commonly accepted today that the cumulative earnings of the airline industry over its entire history have been negative. The lesson Graham is driving at is not that you should avoid buying airline stocks, but that you should never succumb to the “certainty” that any industry will outperform all others in the future. Strangely enough, we shall suggest as one of our chief requirements here that our readers limit themselves to issues selling not far above their tangible-asset value. So long as you keep enough cash on hand to meet your spending needs, you should welcome a bear market, since it puts stocks back on sale. Outright speculation is neither illegal, immoral, nor (for most people) fattening to the pocketbook. More than that, some speculation is necessary and unavoidable, for in many common-stock situations there are substantial possibilities of both profit and loss, and the risks therein must be assumed by someone. There is intelligent speculation as there is intelligent investing. But there are many ways in which speculation may be unintelligent. Of these the foremost are: (1) speculating when you think you are investing; (2) speculating seriously instead of as a pastime, when you lack proper knowledge and skill for it; and (3) risking more money in speculation than you can afford to lose. Since you cannot predict the behavior of the markets, you must learn how to predict and control your own behavior. Utilize one of the “common trust funds,” or “commingled funds,” operated by trust companies and banks in many states. We are thus led to the following logical if disconcerting conclusion: To enjoy a reasonable chance for continued better than average results, the investor must follow policies which are (1) inherently sound and promising, and (2) not popular on Wall Street. The intelligent investor never dumps a stock purely because its share price has fallen; she always asks first whether the value of the company’s underlying businesses has changed. As Graham never stops reminding us, stocks do well or poorly in the future because the businesses behind them do well or poorly-nothing more, and nothing less. Is there a persuasive reason to believe that common stocks are likely to do much better in future years than they have in the last five and one-half decades? Our answer to this crucial question must be a flat no. There is no close time connection between inflationary (or deflationary) conditions and the movement of common-stock earnings and prices. It took 25 years for General Electric (and the DJIA itself) to recover the ground lost in the 1929-1932 debacle. Besides that, if the investor concentrates his portfolio on common stocks he is very likely to be led astray either by exhilarating advances or by distressing declines. The outright ownership of real estate has long been considered as a sound long-term investment, carrying with it a goodly amount of protection against inflation. Unfortunately, real-estate values are also subject to wide fluctuations; serious errors can be made in location, price paid, etc. Inflation is so easy to overlook-and why it’s so important to measure your investing success not just by what you make, but by how much you keep after inflation. Completely eradicating inflation runs against the economic self-interest of any government that regularly borrows money. In a time of deflation (or steadily falling prices) it’s more advantageous to be a lender than a borrower-which is why most investors should keep at least a small portion of their assets in bonds, as a form of insurance against deflating prices. TIPS also guarantee that the value of your investment won’t be eroded by inflation. In one easy package, you insure yourself against financial loss and the loss of purchasing power. TIPS are best suited for a tax-deferred retirement account like an IRA, Keogh, or 401 (k), where they will not jack up your taxable income. For most investors, allocating at least 10% of your retirement assets to TIPS is an intelligent way to keep a portion of your money absolutely safe-and entirely beyond the reach of the long, invisible claws of inflation. The “price/earnings ratio” of a stock, or of a market average like the S&P 500-stock index, is a simple tool for taking the market’s temperature. If, for instance, a company earned $1 per share of net income over the past year, and its stock is selling at $8.93 per share, its price/earnings ratio would be 8.93; if, however, the stock is selling at $69.70, then the price/earnings ratio would be 69.7. In general, a price/earnings ratio (or “P/E” ratio) below 10 is considered low, between 10 and 20 is considered moderate, and greater than 20 is considered expensive. Is the stock market riskier today than two years ago simply because prices are higher? The answer is yes. It always has been. It always will be. Gallup found in 2001 and 2002 that the average expectation of one-year returns on stocks had slumped to 7%-even though investors could now buy at prices nearly 50% lower than in 2000. The more enthusiastic investors become about the stock market in the long run, the more certain they are to be proved wrong in the short run. In the long run, the yearly growth in corporate earnings per share has averaged 1.5% to 2% (not counting inflation). As of early 2003, inflation was running around 2.4% annually; the dividend yield on stocks was 1 .9%. So, 1 .5% to 2% + 2.4% + 1 .9% = 5.8% to 6.3%. In the long run, that means you can reasonably expect stocks to average roughly a 6% return (or 4% after inflation). By scanning the historical record, Shiller has shown that when his ratio goes well above 20, the market usually delivers poor returns afterward; when it drops well below 10, stocks typically produce handsome gains down the road. The only indisputable truth that the past teaches us is that the future will always surprise us-always! The rate of return sought should be dependent, rather, on the amount of intelligent effort the investor is willing and able to bring to bear on his task. The minimum return goes to our passive investor, who wants both safety and freedom from concern. The maximum return would be realized by the alert and enterprising investor who exercises maximum intelligence and skill. In practical terms, we advise the investor in long-term issues to sacrifice a small amount of yield to obtain the assurance of noncallability — say for 20 or 25 years. Similarly there is an advantage in buying a low-coupon bond at a discount rather than a high coupon bond selling at about par and callable in a few years. Really good preferred stocks can and do exist, but they are good in spite of their investment form, which is an inherently bad one. Or by creating a permanent portfolio that runs on autopilot and requires no further effort (but generates very little excitement). Once you set the target percentages of your portfolio, change them only as your life circumstances change. Do not buy more stocks because the stock market has gone up; do not sell them because it has gone down. The very heart of Graham’s approach is to replace guesswork with discipline. Two good online calculators that will help you compare the after-tax income of municipal and taxable bonds can be found at www.investinginbonds.com/cgi-bin/calculator.pl and www.lebenthal.com/index_infocenter.html. A “laddered” portfolio, holding bonds across a range of maturities, is another way of hedging interest-rate risk. Buying individual bonds makes no sense unless you have at least $100,000 to invest. Bond funds offer cheap and easy diversification, along with the convenience of monthly income, which you can reinvest right back into the fund at current rates without paying a commission. If you had invested $1 in U.S. stocks in 1900 and spent all your dividends, your stock portfolio would have grown to $198 by 2000. But if you had reinvested all your dividends, your stock portfolio would have been worth $16,797! Far from being an afterthought, dividends are the greatest force in stock investing. There should be adequate though not excessive diversification. This might mean a minimum of ten different issues and a maximum of about thirty. Each company selected should be large, prominent, and conservatively financed. Indefinite as these adjectives must be, their general sense is clear. Each company should have a long record of continuous dividend payments. The investor should impose some limit on the price he will pay for an issue in relation to its average earnings over, say the past seven years. We suggest that this limit be set at 25 times such average earnings, and not more than 20 times those of the last twelve-month period. But such a restriction would eliminate nearly all the strongest and most popular companies from the portfolio. By “the rule of 72,” at 10% interest a given amount of money doubles in just over seven years, while at 7% it doubles in just over 10 years. When interest rates are high, the amount of money you need to set aside today to reach a given value in the future is lower because those high interest rates will enable it to grow at a more rapid rate. Thus a rise in interest rates today makes a future stream of earnings or dividends less valuable-since the alternative of investing in bonds has become relatively more attractive. The New York Stock Exchange has put considerable effort into popularizing its “monthly purchase plan,” under which an investor devotes the same dollar amount each month to buying one or more common stocks. This is an application of a special type of “formula investment” known as dollar-cost averaging. Common stocks are becoming generally accepted as a necessary component of a sound savings-investment program. Thus, systematic and uniform purchases of common stocks may present no more psychological and financial difficulties than similar continuous payments for United States savings bonds and for life insurance — to which they should be complementary. The monthly amount may be small, but the results after 20 or more years can be impressive and important to the saver. We urge the beginner in security buying not to waste his efforts and his money in trying to beat the market. Let him study security values and initially test out his judgment on price versus value with the smallest possible sums. Thus we return to the statement, made at the outset, that the kind of securities to be purchased and the rate of return to be sought depend not on the investor’s financial resources but on his financial equipment in terms of knowledge, experience, and temperament. In today’s markets, to be considered large, a company should have a total stock value (or “market capitalization“) of at least $10 billion. After you burn your mouth on hot milk, you blow on your yogurt.” Because the crash of 2000-2002 was so terrible, many investors now view stocks as scaldingly risky; but, paradoxically, the very act of crashing has taken much of the risk out of the stock market. It was hot milk before, but it is room-temperature yogurt now. Lynch’s rule-“You can outperform the experts if you use your edge by investing in companies or industries you already understand” isn’t totally implausible, and thousands of investors have profited from it over the years. But Lynch’s rule can work only if you follow its corollary as well: “Finding the promising company is only the first step. The next step is doing the research.” To his credit, Lynch insists that no one should ever invest in a company, no matter how great its products or how crowded its parking lot, without studying its financial statements and estimating its business value. Unless you are not willing to spread your bets, you shouldn’t bet at all. If, after you set up such an online autopilot portfolio, you find yourself trading more than twice a year-or spending more than an hour or two per month, total, on your investments-then something has gone badly wrong. Do not let the ease and up-to-the-minute feel of the Internet seduce you into becoming a speculator. A defensive investor runs-and wins-the race by sitting still. By enabling you to say “I don’t know and I don’t care,” a permanent autopilot portfolio liberates you from the feeling that you need to forecast what the financial markets are about to do-and the illusion that anyone else can. The knowledge of how little you can know about the future, coupled with the acceptance of your ignorance, is a defensive investor’s most powerful weapon. We have no concrete reason to be concerned about the future history of well-regarded foreign bonds such as those of Australia or Norway. But we do know that, if and when trouble should come, the owner of foreign obligations has no legal or other means of enforcing his claim. Our one recommendation is that all investors should be wary of new issues — which mean, simply, that these should be subjected to careful examination and unusually severe tests before they are purchased. There are two reasons for this double caveat. The first is that new issues have special salesmanship behind them, which calls therefore for a special degree of sales resistance. The second is that most new issues are sold under “favorable market conditions” – which means favorable for the seller and consequently less favorable for the buyer corporations choose to offer new shares to the public when the stock market is near a peak? Bull-market periods are usually characterized by the transformation of a large number of privately owned businesses into companies with quoted shares. By an unfortunate correlation, during the same period the stock-buying public has been developing an ingrained preference for the major companies and a similar prejudice against the minor ones. This prejudice, like many others, tends to become weaker as bull markets are built up; the large and quick profits shown by common stocks as a whole are sufficient to dull the public’s critical faculty, just as they sharpen its acquisitive instinct. More important, buying IPOs is a bad idea because it flagrantly violates one of Graham’s most fundamental rules: No matter how many other people want to buy a stock, you should buy only if the stock is a cheap way to own a desirable business. For the defensive investor we suggested an upper limit of purchase price at 25 times average earnings of the past seven years. Notice that Graham insists on calculating the price/earnings ratio based on a multiyear average of past earnings. That way, you lower the odds that you will overestimate a company’s value based on a temporarily high burst of profitability. It’s worth noting that the prevailing method on Wall Street today basing price/earnings ratios primarily on “next year’s earnings”-would be anathema to Graham. How can you value a company based on earnings it hasn’t even generated yet? To obtain better than average investment results over a long pull requires a policy of selection or operation possessing a twofold merit: (1) It must meet objective or rational tests of underlying soundness; and (2) it must be different from the policy followed by most investors or speculators. The key requirement here is that the enterprising investor concentrates on the larger companies that are going through a period of unpopularity. First, they have the resources in capital and brain power to carry them through adversity and back to a satisfactory earnings base. Second, the market is likely to respond with reasonable speed to any improvement shown. To be as concrete as possible, let us suggest that an issue is not a true “bargain” unless the indicated value is at least 50% more than the price. The type of bargain issue that can be most readily identified is a common stock that sells for less than the company’s net working capital alone, after deducting all prior obligations. This would mean that the buyer would pay nothing at all for the fixed assets — buildings, machinery, etc., or any goodwill items that might exist. By “net working capital,” Graham means a company’s current assets (such as cash, marketable securities, and inventories) minus its total liabilities (including preferred stock and long-term debt). The typical “special situation” has grown out of the increasing number of acquisitions of smaller firms by large ones, as the gospel of diversification of products has been adopted by more and more managements. Never buy into a lawsuit remains a valid rule for all but the most intrepid investors to live by. Growth stocks are worth buying when their prices are reasonable, but when their price/earnings ratios go much above 25 or 30 the odds get ugly: Journalist Carol Loomis found that, from 1960 through 1999, only eight of the largest 150 companies on the Fortune 500 list managed to raise their earnings by an annual average of at least 15% for two decades. Looking at five decades of data showed that only 10% of large U.S. companies had increased their earnings by 20% for at least five consecutive years; only 3% had grown by 20% for at least 10 years straight; and not a single one had done it for 15 years in a row. An academic study of thousands of U.S. stocks from 1951 through 1998 found that over all 10-year periods, net earnings grew by an average of 9.7% annually. But for the biggest 20% of companies, earnings grew by an annual average of just 9.3%. Even many corporate leaders fail to understand these odds. The intelligent investor, however, gets interested in big growth stocks not when they are at their most popular-but when something goes wrong. So how many of the Forbes 400 fortunes from 1982 remained on the list 20 years later? Only 64 of the original members-a measly 16%-were still on the list in 2002. To see whether a stock is selling for less than the value of net working capital (what Graham’s followers call “net nets”), download or request the most recent quarterly or annual report from the company’s website or from the EDGAR database at www.sec.gov. From the company’s current assets, subtract its total liabilities, including any preferred stock and long-term debt. It’s not that you should never invest in foreign markets like Japan; it’s that the Japanese should never have kept all their money at home. And neither should you. Putting up to a third of your stock money in mutual funds that hold foreign stocks (including those in emerging markets) helps insure against the risk that our own backyard may not always be the best place in the world to invest. Since common stocks, even of investment grade, are subject to recurrent and wide fluctuations in their prices, the intelligent investor should be interested in the possibilities of profiting from these pendulum swings. There are two possible ways by which he may try to do this: the way of timing and the way of pricing. By timing we mean the endeavor to anticipate the action of the stock market — to buy or hold when the future course is deemed to be upward, to sell or refrain from buying when the course is downward. By pricing we mean the endeavor to buy stocks when they are quoted below their fair value and to sell them when they rise above such value. A less ambitious form of pricing is the simple effort to make sure that when you buy you do not pay too much for your stocks. This may suffice for the defensive investor, whose emphasis is on long-pull holding; but as such it represents an essential minimum of attention to market levels. Nearly all the bull markets had a number of well-defined characteristics in common, such as (1) a historically high price level, (2) high price/ earnings ratios, (3) low dividend yields as against bond yields, (4) much speculation on margin, and (5) many offerings of new common-stock issues of poor quality. The better a company’s record and prospects, the less relationship the price of its shares will have to their book value. But the greater the premium above book value, the less certain the basis of determining its intrinsic value — i.e., the more this “value” will depend on the changing moods and measurements of the stock market. Thus we reach the final paradox, that the more successful the company, the greater are likely to be the fluctuations in the price of its shares. This really means that, in a very real sense, the better the quality of a common stock, the more speculative it is likely to be — at least as compared with the unspectacular middle-grade issues. A stock does not become a sound investment merely because it can be bought at close to its asset value. The investor should demand, in addition, a satisfactory ratio of earnings to price, a sufficiently strong financial position, and the prospect that its earnings will at least be maintained over the years. We see in this history how wide can be the vicissitudes of a major American enterprise in little more than a single generation, and also with what miscalculations and excesses of optimism and pessimism the public has valued its shares. There are two chief morals to this story. The first is that the stock market often goes far wrong, and sometimes an alert and courageous investor can take advantage of its patent errors. The other is that most businesses change in character and quality over the years, sometimes for the better, perhaps more often for the worse. The investor need not watch his companies’ performance like a hawk; but he should give it a good, hard look from time to time. As in all other activities that emphasize price movements first and underlying values second, the work of many intelligent minds constantly engaged in this field tends to be self-neutralizing and self-defeating over the years. Nothing important on Wall Street can be counted on to occur exactly in the same way as it happened before. The price fluctuations of convertible bonds and preferred stocks are the resultant of three different factors: (1) variations in the price of the related common stock, (2) variations in the credit standing of the company, and (3) variations in general interest rates. The intelligent investor shouldn’t ignore Mr. Market entirely. Instead, you should do business with him-but only to the extent that it serves your interests. Mr. Market’s job is to provide you with prices; your job is to decide whether it is to your advantage to act on them. You do not have to trade with him just because he constantly begs you to. 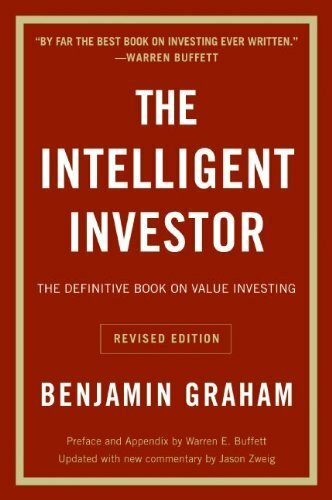 One of Graham’s most powerful insights is this: “The investor who permits him to be stampeded or unduly worried by unjustified market declines in his holdings is perversely transforming his basic advantage into a basic disadvantage.” What does Graham mean by those words “basic advantage”? He means that the intelligent individual investor has the full freedom to choose whether or not to follow Mr. Market. You have the luxury of being able to think for yourself. With billions of dollars under management, they must gravitate toward the biggest stocks-the only ones they can buy in the multimillion-dollar quantities they need to fill their portfolios. Thus many funds end up owning the same few overpriced giants. Investors tend to pour more money into funds as the market rises. The managers use that new cash to buy more of the stocks they already own, driving prices to even more dangerous heights. If fund investors ask for their money back when the market drops, the managers may need to sell stocks to cash them out. Many portfolio managers get bonuses for beating the market, so they obsessively measure their returns against benchmarks like the S&P 500 index. So there’s no reason you can’t do as well as the pros. What you cannot do (despite all the pundits who say you can) is to “beat the pros at their own game.” The pros can’t even win their own game! Why should you want to play it at all? If you follow their rules, you will lose-since you will end up as much a slave to Mr. Market as the professionals are. Paradoxically, “you will be much more in control,” explains neuroscientist Antonio Damasio, “if you realize how much you are not in control.” By acknowledging your biological tendency to buy high and sell low, you can admit the need to dollar-cost average, rebalance, and sign an investment contract. By putting much of your portfolio on permanent autopilot, you can fight the prediction addiction, focus on your long-term financial goals, and tune out Mr. Market’s mood swings. Investors who received frequent news updates on their stocks earned half the returns of investors who got no news at all. You could have done what most people do-either whine about your loss, or sweep it under the rug and pretend it never happened. Or you could have taken control. Before 2002 ended, you could have sold all your Coke shares, locking in the $3,200 loss. Then, after waiting 31 days to comply with IRS rules, you would buy 200 shares of Coke all over again. The result: You would be able to reduce your tax- able income by $3,000 in 2002, and you could use the remaining $200 loss to offset your income in 2003. And better yet, you would still own a company whose future you believe in-but now you would own it for almost one-third less than you paid the first time. With Uncle Sam subsidizing your losses, it can make sense to sell and lock in a loss. If Uncle Sam wants to make Mr. Market look logical by comparison, who are we to complain? They have promoted good habits of savings and investment; they have protected countless individuals against costly mistakes in the stock market; they have brought their participants income and profits commensurate with the overall returns from common stocks. On a comparative basis we would hazard the guess that the average individual who put his money exclusively in investment-fund shares in the past ten years has fared better than the average person who made his common-stock purchases directly. For periods as long as 10 years, the returns of the Dow and the S&P 500 can diverge by fairly wide margins. Over the course of the typical investing lifetime, however-say 25 to 50 years-their returns have tended to converge quite closely. Intriguingly, the disastrous boom and bust of 1999-2002 also came roughly 35 years after the previous cycle of insanity. Perhaps it takes about 35 years for the investors who remember the last “New Economy” craze to become less influential than those who do not. If this intuition is correct, the intelligent investor should be particularly vigilant around the year 2030. This is yet another reminder that the market’s hottest market sector-in 1999 that was technology-often turns as cold as liquid nitrogen, with blinding speed and utterly no warning. And it’s a reminder that buying funds based purely on their past performance is one of the stupidest things an investor can do. Financial scholars have been studying mutual-fund performance for at least a half century, and they are virtually unanimous on several points: the average fund does not pick stocks well enough to overcome its costs of researching and trading them; the higher a fund’s expenses, the lower its returns; the more frequently a fund trades its stocks, the less it tends to earn; highly volatile funds, which bounce up and down more than average, are likely to stay volatile; funds with high past returns are unlikely to remain winners for long. Sector funds specializing in almost every imaginable industry are available-and date back to the 1920s. After nearly 80 years of history, the evidence is overwhelming: The most lucrative, and thus most popular, sector of any given year often turns out to be among the worst performers of the following year. There’s a second lesson here: To succeed, the individual investor must either avoid shopping from the same list of favorite stocks that have already been picked over by the giant institutions, or own them far more patiently. So when should you sell? Here a few definite red flags: a sharp and unexpected change in strategy, such as a “value” fund loading up on technology stocks in 1999 or a “growth” fund buying tons of insurance stocks in 2002; an increase in expenses, suggesting that the managers are lining their own pockets; large and frequent tax bills generated by excessive trading; suddenly erratic returns, as when a formerly conservative fund generates a big loss (or even produces a giant gain). If you’re not prepared to stick with a fund through at least three lean years, you shouldn’t buy it in the first place. This is their general view that a stock should be bought if the near-term prospects of the business are favorable and should be sold if these are unfavorable — regardless of the current price. Such a superficial principle often prevents the services from doing the sound analytical job of which their staffs are capable — namely to ascertain whether a given stock appears over- or undervalued at the current price in the light of its indicated long-term future earning power. The intelligent investor will not do his buying and selling solely on the basis of recommendations received from a financial service. Once this point is established, the role of the financial service then becomes the useful one of supplying information and offering suggestions. Here are some of the questions that prominent financial planners recommended any prospective client should ask: Why are you in this business? What is the mission statement of your firm? Besides your alarm clock, what makes you get up in the morning? What is your investing philosophy? Do you use stocks or mutual funds? Do you use technical analysis? Do you use market timing? (A “yes” to either of the last two questions is a “no” signal to you.) Do you focus solely on asset management, or do you also advice on taxes, estate and retirement planning, budgeting and debt management, and insurance? How do your education, experience, and credentials qualify you to give those kinds of financial advice? What needs do your clients typically have in common? How can you help me achieve my goals? How will you track and report my progress? Do you provide a checklist that I can use to monitor the implementation of any financial plan we develop? If you have less than $100,000 to invest, you may not be able to find a financial adviser who will take your account. In that case, buy a diversified basket of low-cost index funds, follow the behavioral advice throughout this book, and your portfolio should eventually grow to the level at which you can afford an adviser. If the adviser is a line of defense between you and your worst impulsive tendencies, then he or she should have systems in place that will help the two of you control them.” Among those systems: a comprehensive financial plan that outlines how you will earn, save, spend, borrow, and invest your money; an investment policy statement that spells out your fundamental approach to investing; an asset-allocation plan that details how much money you will keep in different investment categories. These are the building blocks on which good financial decisions must be founded, and they should be created mutually-by you and the adviser-rather than imposed unilaterally. You should not invest a dollar or make a decision until you are satisfied that these foundations are in place and in accordance with your wishes. For the more dependent the valuation becomes on anticipations of the future — and the less it is tied to a figure demonstrated by past performance — the more vulnerable it becomes to possible miscalculation and serious error. Don’t take a single year’s earnings seriously and if you do pay attention to short-term earnings, look out for booby traps in the per-share figures. If our first warning were followed strictly the second would be unnecessary. But it is too much to expect that most shareholders can relate all their common-stock decisions to the long-term record and the long-term prospects. In short, pro forma earnings enable companies to show how well they might have done if they hadn’t done as badly as they did. As an intelligent investor, the only thing you should do with pro forma earnings is ignore them. Read backwards. When you research a company’s financial reports, start reading on the last page and slowly work your way toward the front. Anything that the company doesn’t want you to find is buried in the back-which is precisely why you should look there first. No earnings deficit in the past 10 years. 10 year growth of at least one-third in per-share earnings. Price no more than 15 times average earnings of the past 3 years. Moderate P/E ratio – Graham recommends limiting yourself to stocks whose current price is no more than 15 times average earnings over the past three years. Incredibly, the prevailing practice on Wall Street today is to value stocks by dividing their current price by something called “next year’s earnings.” That gives what is sometimes called “the forward P/E ratio.” But it’s nonsensical to derive a price/earnings ratio by dividing the known current price by unknown future earnings. Anything company with over 60% institutional ownership suggests that a stock is scarcely undiscovered and probably “overowned.” (When big institutions sell, they tend to move in lockstep, with disastrous results for the stock. If you are not willing to go to the minimal effort of reading the proxy and making basic comparisons of financial health across five years’ worth of annual reports, then you are too defensive to be buying individual stocks at all. Get yourself out of the stock-picking business and into an index fund, where you belong. In Graham’s terms, a large amount of goodwill can result from two causes: a corporation can acquire other companies for substantially more than the value of their assets, or its own stock can trade for substantially more than its book value. His second choice would be to apply a set of standards to each purchase, to make sure that he obtains (1) a minimum of quality in the past performance and current financial position of the company, and also (2) a minimum of quantity in terms of earnings and assets per dollar of price. At the close of the previous chapter we listed seven such quality and quantity criteria suggested for the selection of specific common stocks. Let us describe them in order. In a remarkable confirmation of Graham’s point, the dull-sounding Standard & Poor’s Utility Index outperformed the vaunted NASDAQ Composite Index for the 30 years ending December 31 , 2002. For most people, investing on the basis of protection from overpaying for a stock and from overconfidence in the quality of their own judgment-is the best solution. Keep 90% of your stock money in an index fund, leaving 10°/o with which to try picking your own stocks. Only after you build that solid core should you explore. Graham advised investors to practice first, just as even the greatest athletes and musicians practice and rehearse before every actual performance. He suggested starting off by spending a year tracking and picking stocks (but not with real money). If you enjoyed the experiment and earned sufficiently good returns, gradually assemble a basket of stocks-but limit it to a maximum of 10% of your overall portfolio (keep the rest in an index fund). And remember, you can always stop if it no longer interests you or your returns turn bad. Total assets minus cash (as well as short-term investments and non-interest bearing current liabilities) plus past accounting charges that reduced invested capital. ROIC has the virtue of showing, after all legitimate expenses what the company earns from its operating businesses-and how efficiently it has used the shareholders’ money to generate that return. An ROIC of at least 10% is attractive; even 6% or 7% can be tempting if the company has good brand names, focused management, or is under a temporary cloud. Look for companies that limit issuance of stock options to roughly 3°/o of shares outstanding. One technique that can be helpful: See which leading professional money managers own the same stocks you do. If one or two names keep turning up, go to the websites of those fund companies and download their most recent reports. By seeing which other stocks these investors own, you can learn more about what qualities they have in common; by reading the managers’ commentary, you may get ideas on how to improve your own approach. No matter which techniques they use in picking stocks, successful investing professionals have two things in common: First, they are disciplined and consistent, refusing to change their approach even when it is unfashionable. Second, they think a great deal about what they do and how to do it, but they pay very little attention to what the market is doing. Buffett likes to snap up a stock when a scandal, big loss, or other bad news passes over it like a storm cloud-as when he bought Coca-Cola soon after its disastrous rollout of “New Coke” and the market crash of 1987. He also wants to see managers who set and meet realistic goals; build their businesses from within rather than through acquisition; allocate capital wisely; and do not pay themselves hundred-million-dollar jackpots of stock options. Buffett insists on steady and sustainable growth in earnings, so the company will be worth more in the future than it is today. Let us mince no words at the outset. We consider the recent development of stock-option warrants as a near fraud, an existing menace, and a potential disaster. If a stockbroker ever offers to sell you “units” in any company, you can be 95% certain that warrants are involved, and at least 90% certain that the broker is either a thief or an idiot. Legitimate brokers and firms have no business in this area. The intelligent investor will never buy a convertible bond fund with annual operating expenses exceeding 1.0%. Ask yourself which company’s stock would be likely to rise more: one that discovered a cure for a rare cancer, or one that discovered a new way to dispose of a common kind of garbage. The cancer cure sounds more exciting to most investors, but a new way to get rid of trash would probably make more money. What have we learned? The market scoffs at Graham’s principles in the short run, but they are always revalidated in the end. If you buy a stock purely because its price has been going up-instead of asking whether the underlying company’s value is increasing-then sooner or later you will be extremely sorry. That’s not a likelihood. It is a certainty. What we should call a proper stock dividend is one that is paid to shareholders to give them a tangible evidence or representation of specific earnings which have been reinvested in the business for their account over some relatively short period in the recent past — say, not more than the two preceding years. Two clear lessons emerge from this disaster: Never dig so deep into the numbers that you check your common sense at the door, and always read the proxy statement before (and after) you buy a stock. When current dividends are low, future corporate earnings also turn out to be low. And when current dividends are high, so are future earnings. Over 10-year periods, the average rate of earnings growth was 3.9 points greater when dividends were high than when they were low. In short, most managers are wrong when they say that they can put your cash to better use than you can. Paying out a dividend does not guarantee great results, but it does improve the return of the typical stock by yanking at least some cash out of the managers’ hands before they can either squander it or squirrel it away. Unfortunately, in the real world, stock buybacks have come to serve a purpose that can only be described as sinister. Now that grants of stock options have become such a large part of executive compensation, many companies-especially in hightech industries-must issue hundreds of millions of shares to give to the managers who exercise those stock options. But that would jack up the number of shares outstanding and shrink earnings per share. “..the responsibility of managements to act in the interest of their shareholders includes the obligation to prevent-in so far as they are able the establishment of either absurdly high or unduly low prices for their securities.” Thus, enhancing shareholder value doesn’t just mean making sure that the stock price does not go too low; it also means ensuring that the stock price does not go up to unjustifiable levels. If only the executives of Internet companies had heeded Graham’s wisdom back in 1999! However, the risk of paying too high a price for good-quality stocks — while a real one — is not the chief hazard confronting the average buyer of securities. Observation over many years has taught us that the chief losses to investors come from the purchase of low-quality securities at times of favorable business conditions. Imagine that you find a stock that you think can grow at 10% a year even if the market only grows 5% annually. Unfortunately, you are so enthusiastic that you pay too high a price, and the stock loses 50% of its value the first year. Even if the stock then generates double the market’s return, it will take you more than 16 years to overtake the market-simply because you paid too much, and lost too much, at the outset. Risk exists in another dimension: inside you. If you overestimate how well you really understand an investment, or overstate your ability to ride out a temporary plunge in prices, it doesn’t matter what you own or how the market does. Ultimately, financial risk resides not in what kinds of investments you have, but in what kind of investor you are. If you want to know what risk really is, go to the nearest bathroom and step up to the mirror. That’s risk, gazing back at you from the glass. “correctly-anticipated regret” (how will I react if my analysis turns out to be wrong?). To find out whether your confidence is well-calibrated, look in the mirror and ask yourself: “What is the likelihood that my analysis is right?” Think carefully through these questions: How much experience do I have? What is my track record with similar decisions in the past? What is the typical track record of other people who have tried this in the past? If I am buying, someone else is selling. How likely is it that I know something that this other person (or company) does not know? If I am selling, someone else is buying. How likely is it that I know something that this other person (or company) does not know? If I’m right, I could make a lot of money. But what if I’m wrong? Based on the historical performance of similar investments, how much could I lose? Do I have other investments that will tide me over if this decision turns out to be wrong? Do I already hold stocks, bonds, or funds with a proven record of going up when the kind of investment I’m considering goes down? Am I putting too much of my capital at risk with this new investment? When I tell myself, “You have a high tolerance for risk,” how do I know? Have I ever lost a lot of money on an investment? How did it feel? Did I buy more, or did I bail out? Am I relying on my willpower alone to prevent me from panicking at the wrong time? Or have I controlled my own behavior in advance by diversifying, signing an investment contract, and dollar-cost averaging? …every time Perimeter buys a stock it’s because he’s getting more for his money than he’s paying. That’s the only thing he’s thinking about. He’s not looking at quarterly earnings projections, he’s not looking at next year’s earnings, he’s not thinking about what day of the week it is, he doesn’t care what investment research from any place says, he’s not interested in price momentum, volume, or anything. He’s simply asking: What is the business worth? I have never been able to figure out why it’s riskier to buy $400 million worth of properties for $40 million than $80 million. This entry was posted in Books and tagged Benjamin Graham, Finance, Investing on December 17, 2014 by Blas.